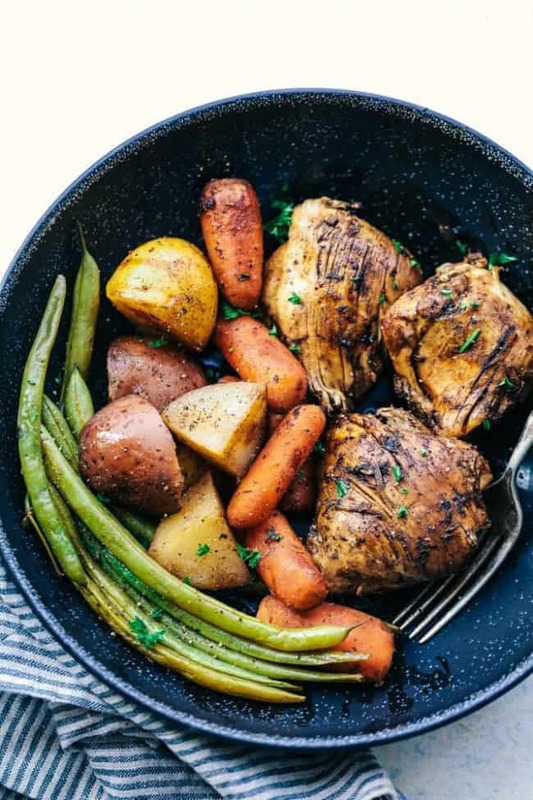 Slow Cooker Brown Sugar Balsamic Chicken and Vegetables is a fantastic meal with tender and juicy chicken with a delicious sweet and tangy balsamic sauce. This slow cooks to perfection with veggies making an awesome meal in one! Spring seemed like it was just around the corner. Until we got dumped with more snow this week. The groundhog just had to see his shadow this year and curse us with six more weeks of winter. 😉 Luckily we are headed to warmer weather soon in Hawaii and can escape the winter for a bit. I may just stay in Hawaii and never come back! I know slow cookers are pretty popular in the winter time but I use mine all throughout the year. 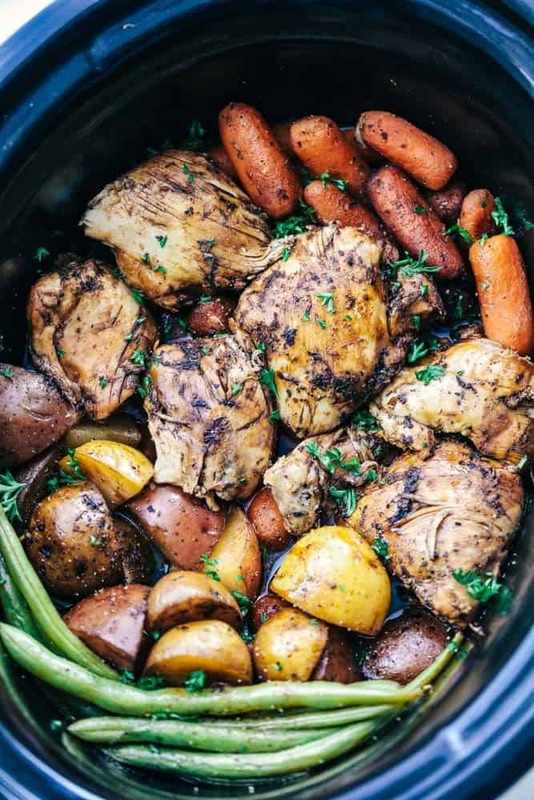 There is just something about the slow cooker that I absolutely love. So much that I have six! Yep six. I am kind of a hoarder with slow cookers but I just love them so dang much. The meat and veggies just slow cooks all day to tender perfection. I am also a huge lover of balsamic vinegar. 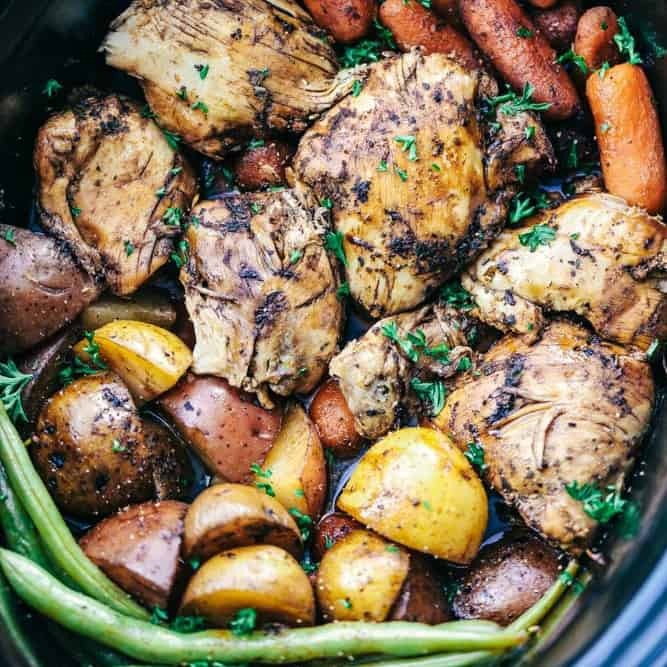 You will not believe how minimal the ingredients are in this slow cooker meal and how incredible the flavors are. 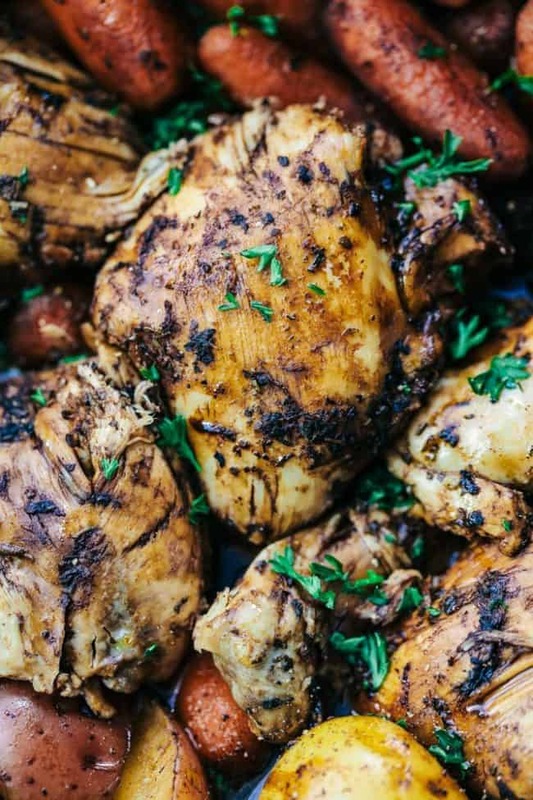 You don’t need a lot of ingredients when using balsamic vinegar and you just let it do its thing and add that tangy flavor that we all love. Of course I do love using brown sugar with balsamic vinegar. It is going to add just a bit of sweet making it sweet and tangy. It is incredible! So let’s break this meal down. An easy dump it in a slow cooker meal with minimal ingredients and it has incredible flavor. This meal is a no brainer! The chicken is melt in your mouth tender and the veggies cook to perfect tender perfection. This meal will become one that you make again and again. I know that your family will love it just as much as we did! Pour olive oil and garlic in the bottom of your 5-6 quart slow cooker. Line the bottom with baby carrots and potatoes. Add the chicken thighs on top. In a small bowl whisk together the brown sugar and balsamic vinegar. Pour it on top of the chicken thighs and veggies. Cover and cook on low heat for 8 hours or high for 4 hours. Add green beans during the last 30 minutes of cooking time. Garnish with fresh parsley. Enjoy! THIS LOOKS GREAT AND I’LL TRY, BUT 1ST I’D LIKE YOUR HELP. MY LOCAL BUTCHER HAS TOP SIRLOIN ROAST AND STEAKS ON SALE FOR $2.99 POUND AND I WONDER IF YOU HAVE ANY RECIPES THAT YOU WILL SHARE SO I CAN TAKE ADVANTAGE OF THIS SUPER PRICE? THIS BACHELOR WOULD BE GRATEFUL. You sent this same message to Closet Cooking. I would substitute the chicken with skinless boneless chicken breast and that’s what my family enjoys does that change the cooking time? I would like to know this also. I am not a fan of chicken thighs or legs, so can it be made using chicken breasts? This looks like such a great comfort meal! I love chicken and potatoes. 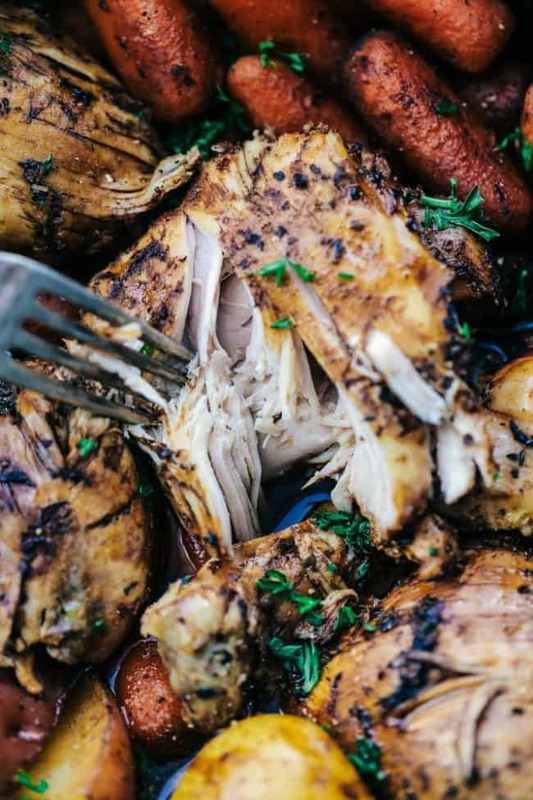 We eat chicken several times a week and I’m always searching for more recipes. And yes, indeed, you can’t beat one pot/pan meals. And I understand travel and wanting to get back to cooking. Hubby and I travel a lot and being back in my own kitchen is a real treat. Great recipe — I’m looking forward to trying it — once we get back home. @TheRecipeCritic This recipe looks delicious. I don’t have/use a slow cooker. @Alyssa I was wondering how you would convert this for a dutch oven? )time? in the oven or on top?) Thank you. This recipe was amazing and the only reason I gave it 4 stars not 5 was because I tweaked it a bit so I can’t speak to the original recipe as is. I increased the quantity of chicken thighs to 14 for 4 people. I’m not sure how big the thighs the person wrote this recipe usually gets, but for me 3 were about equivalent to 1 large boneless skinless chicken breasts. We’re not HUGE eaters and the men ate 4 and the women ate 3 each and everyone finished their plate. Mine is a 5-quart “original crock pot” and the chicken covered the surface without overlapping. I therefore increased the quantity of carrots and balsamic/sugar proportionate to the increase in chicken. Because I didn’t want everything to taste the same, I only cooked the carrots in the slow cooker and did my own roasted potatoes and asparagus separately. I was very glad of this, while the flavour is AMAZING it would have been too much for everything to have the balsamic flavour. My carrots were the really skinny mini ones, that being said, while softer than I’d normally cook them they were DELICIOUS and not mushy (if your store has the fatter mini carrots I would get those)! I was surprised there was no seasoning so I did add salt, pepper, dried rosemary and dried thyme on top of the chicken at the beginning. Can’t say how it would’ve been without, but it was delicious with. No measurement for you but just until it looks well seasoned. Despite the increase in chicken, my cooking time was still accurate (4 hours on low) that being said, it may have been balanced out by the fact I didn’t put potatoes and beans in there so the volume in my crock pot may have been similar. Absolutely delicious, so easy and everyone loved it! Hi Natasha – I am planning to try out your modifications – especially cooking the potatoes and green beans separately. The original recipe says 8 hours on low or 4 hours on high, but you said you cooked yours for 4 hours on low? Is that correct? Hello! This looks so good, I was just wondering if you would be able to freeze some of the chicken and potatoes after it is cooked? I’m a student, so just cooking for one but it is always so useful to have dishes in the freezer! Do you have the nutritional info for this please? Unfortunately, I do not have any nutritional information on my recipes at this time. I recommend using myfitnesspal.com or an app that you are able to type in the ingredients or even the recipe itself to receive the information you would want. Hope that helps! I quartered onions and threw them in as the first layer on the bottom to add more flavor. It all came out great! I’d make this easy meal again! Four hours on high is not nearly long enough to cook baby carrots and potatoes! Perhaps next time i’ll cut them smaller or go the full 8 hours. Going to let the veggies go longer after dinner. Tasted very good though! I also put in basil and oregano, salt and pepper. And always extra garlic. I cooked boneless skinless breasts instead of thighs. Chicken was thoroughly done, veggies not even close. What would be the settings and cooking time for this in an Instapot? I just made this today with chicken breasts and it was delicious. I did, however, make some changes. I did half balsamic and half soy, added 1/2 tsp ground thyme, and 1/4 tsp of salt and pepper. I also sprinkled on some oregano and basil when I added my green beans. Since I used breasts and not thighes, I found everything to be done after only three hours on high. I will definitely be making this again, but next time I will omit the green beans since they came out very shriveled. You basically made another recipe. So I’m a vegan but I cook dinner sometimes for the whole family and thought my other family members would really like this. I just want to clarify, should I defrost the chicken first or can it go in frozen? I prefer to have the chicken defrosted. I added salt and pepper. I never can understand why simple salt and pepper get a bad rap or just intentionally forgotten. Have you done this recipe in the Instant Pot? I would definitely like to try to cook it when I get home but am not home to defrost chicken and be able to put it in crockpot. Thanks! I have not tried it in the instant pot. Let me know if you do and how it turns out!